Bird Photography at Ash Island, Newcastle. 27th February, 2009. Today I went to Ash Island, again! When I pulled up to Wagtail Way, there were the usual Welcome Swallows and the pair of Black-fronted Dotterels at the beginning of the road. So I decided to test out using the Flash. So I put on the flash with a home-made diffuser made out of a milk carton. 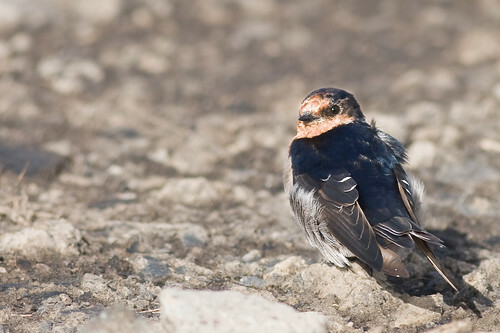 Here is a photo of a Welcome Swallow(Hirundo neoxena) taken with the flash. I carried on down the road and there was not much happening. 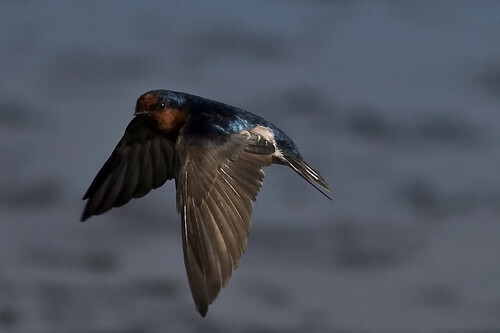 I noticed that the Welcome Swallows were hovering for a longer time than usual so I decided to have a try at catching some in flight. It was extremely difficult to get any in focus, so I just fired away and hoped that some of them would be in focus. Not a recommended technique, in my humble opinion. Anyway, some of them came out in focus, sort of. The lighting was a bit direct and harsh and coming from behind the birds, so that was another hurdle that I had to jump. This one turned his head obligingly so that his head was in the sun. Thank you little fella. And here is the last one in this series. I shot so many duds today and I would hazard a guess that maybe I kept about thirty percent of the photos. 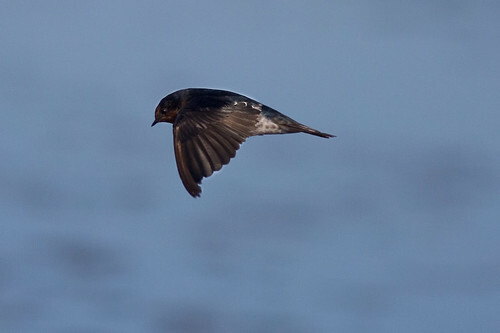 Not a very good statistic, but these birds are very difficult to photograph in flight. 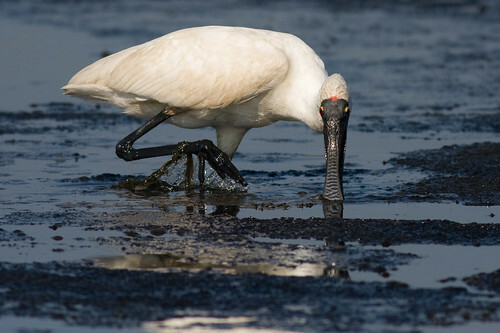 The only other bird around was this Royal Spoonbill(Platalea regia). 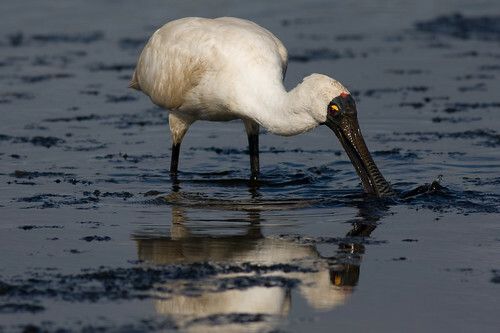 Good old reliable spoonbills, they are always obliging with a ready smile and a swish of the bill. On the way home I spotted a raptor up in the sky but I am not sure what it was. I am awaiting an ID. Bird Photography at the Hunter Wetlands Centre, Shortland. 26th February, 2009. 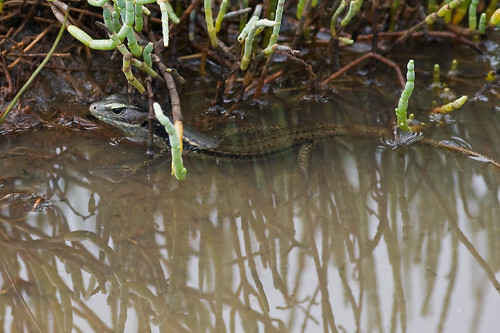 This morning I went late to the Hunter Wetlands Centre at Shortland in Newcastle. It was another overcast day and the mosquitos were biting something chronic. I applied the repellant rather thickly. 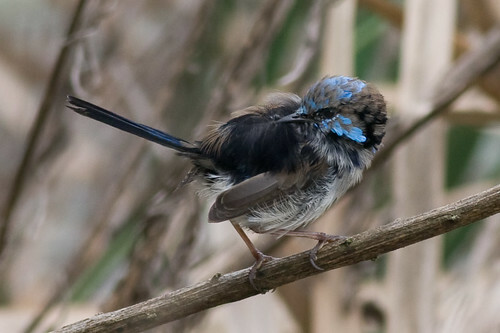 First up is this interesting photo of a moulting male Superb Fairy-wren. His feathers look very bedgraggled. As per usual there was a Whistling Kite circling around looking for a feed. I put this photo in portrait mode for a change. It seems to suit the long wingspan of this remarkable raptor. 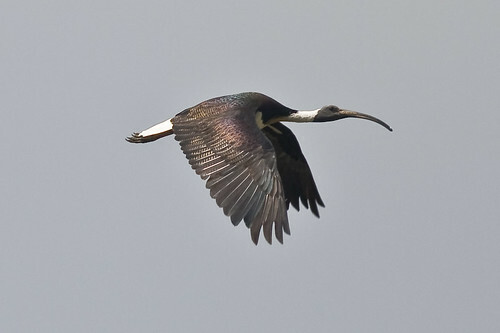 There were heaps and heaps of Straw-necked Ibis roosting in the trees and causing a general nuisance. They cannot seem to sit still for five minutes before they fly off to another tree. They are constantly flying here and there, but why? Check out the colours on this bird’s wings. 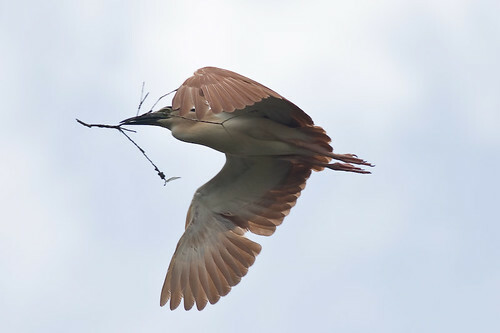 Another very occurrence was the sight of this Nankeen Night Heron with a stick in his bill. I am assuming he is building a nest. But why is he building a nest at this very late stage. And here is the obligatory Great Egret. 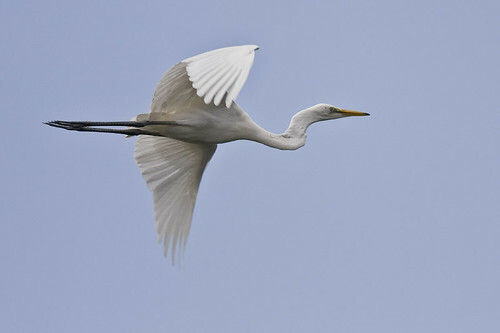 One cannot do anything without a photo of a Great Egret. So here one is, flying. Bird Photography at Belmont Lagoon. 25th February, 2009. 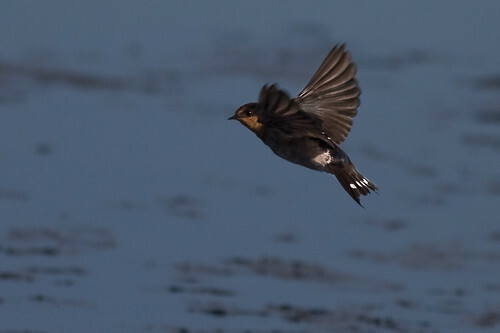 This morning I went to Belmont Lagoon to do some more bird photography. I have been going four mornings in a row. I did want to do some surfing photography the other day but it was not very good, so I just carried on to Redhead Lagoon. 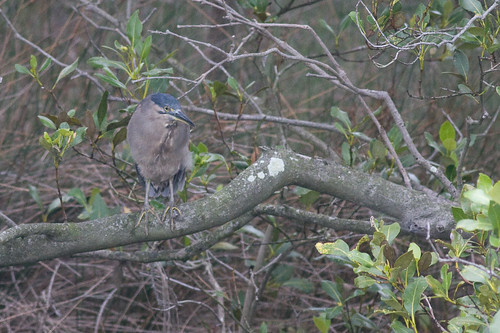 Well this morning I finally got a photo of a Striated Heron(Butorides striatus). This has been my third trip here without a photo of this bird but today I finally cracked it. Its not very good, not sharp and it is noisy, but it is a photo. 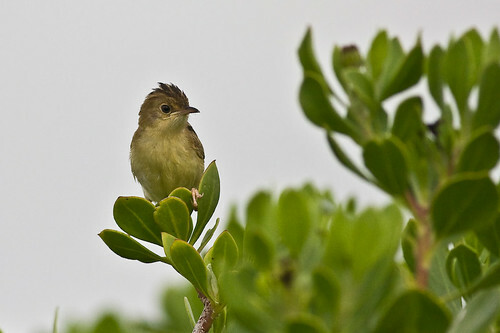 I made my way along the lagoon edge and along the sand dunes I saw a White-cheeked Honeyeater and a Little Wattlebird or two. 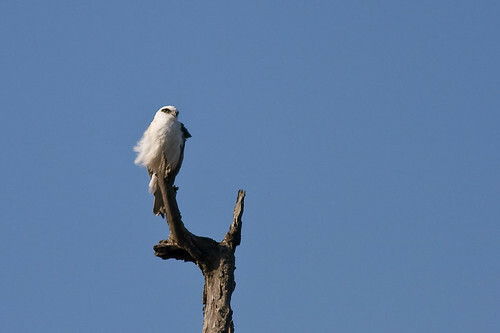 There was a White-bellied Sea-eagle roosting on a dead tree in the middle of a swamp. 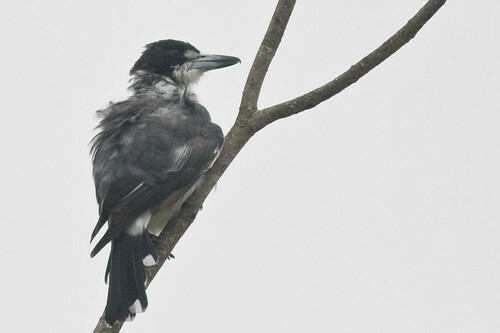 Also roosting on dead trees were a white-faced heron and a cormorant. 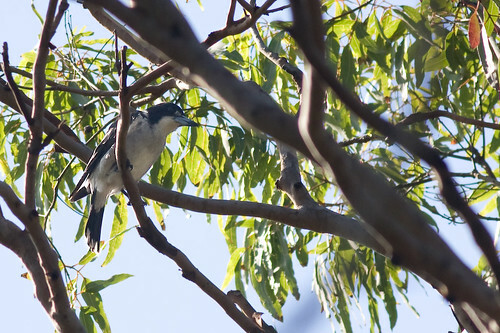 This young Grey Butcherbird was singing a song for me as I headed back towards the peninsula. 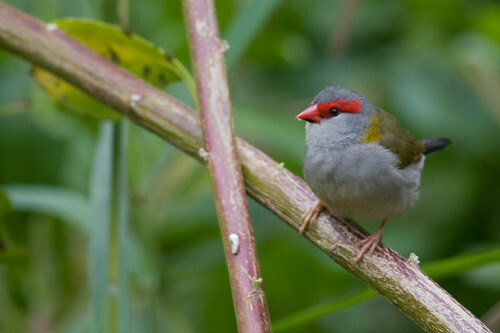 There were a heap of Red-browed Finch along the road and in the trees. 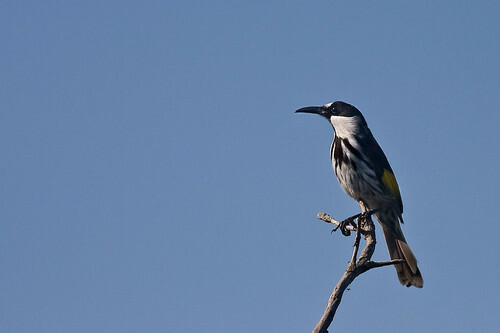 And once again i came upon a White-cheeked honeyeater. These are becoming quite common to see in coastal heathlands. Maybe that is their main habitat. An Azure Kingfisher flashed past me going along the creek, I managed to get a shot off, but it was blurred. Too bad. 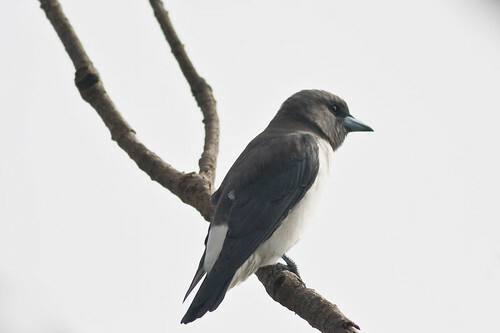 As ever, the White-breasted Woodswallows were posing quite well. They are the attention seekers, aren’t they? 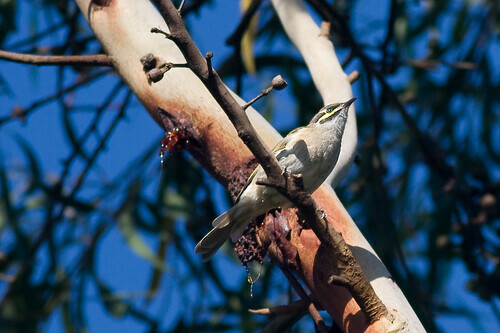 And the Little Wattlebirds were making their usual raucous calls. I am beginning to really like these birds. Bird Photography at Redhead Lagoon and Dudley Bluff, 24th February, 2009. This morning I went to Redhead Lagoon. I parked at the end of Ocean Street. I have been to the little lagoon before but this was the first time up this end. Actually, that is not quite true. I had been there years ago, but had forgotten the way. ha ha. I did a circuit around the lagoon but it was pretty quiet. There were a few ducks and a couple of purple swamphens but not much else. 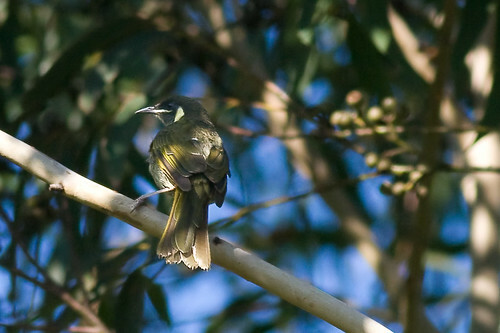 Nearer to the Awabakal Nature Reserve there were a few more birds, such as the Lewin’s Honeyeater. This is a first for me. The photo is rather ordinary but its a record. 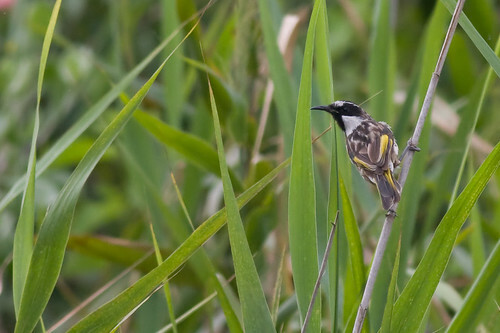 There was also a Yellow-faced Honeyeater. 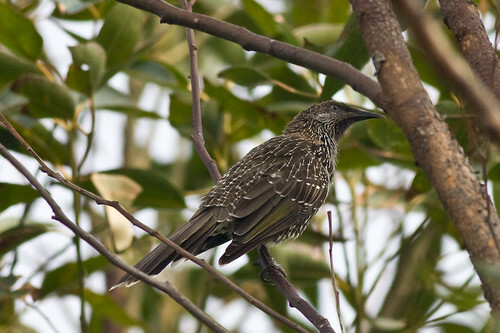 The little wattlebirds and the red wattlebirds were doing their usual raucous call. coook caarrkk.. 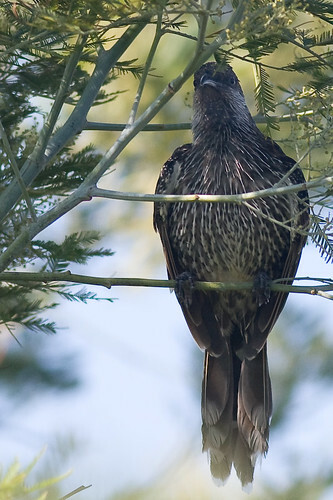 Here is a Little Wattlebird photo. I then headed out to the Dudley Bluff headland and walked along the coast for a way. First thing i spotted was a White-cheeked Honeyeater. 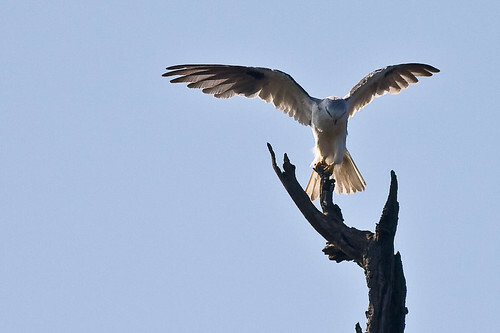 A White-bellied sea-eagle was sitting on a dead tree on the headland, then he flew off. He was too far away to get a good shot. 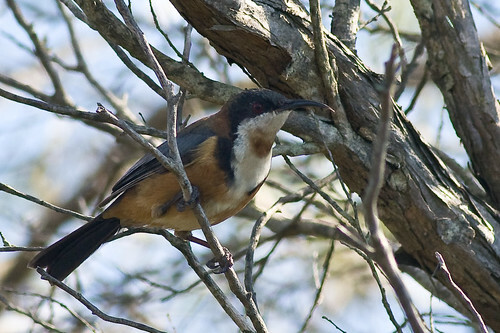 But I did manage to get a photo of an Eastern Spinebill which was a first sighting for me. That was a big tick. woot. That was about it for the day. I am going to go back and walk all the way along the cliff to redhead. The heathland along the cliff is a great place for birds. Ash Island Bird Photography , 23rd February, 2009. I went to Ash Island this morning. Again. The sun was out which was a major change. 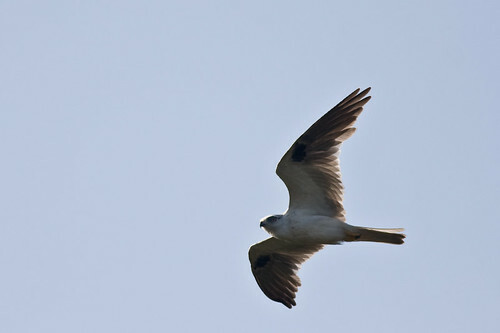 First up I spotted a Black-shouldered Kite sitting in a tree so I snaps off a few photos. You can see them and read about them about two posts back. A pair of whistling kites flew past off in the distance and a couple of Pacific Black Ducks flew past. Here he is. Along the back way I spotted a few White-fronted Chats and some grass birds. When I got to Wagtail Way, the pair of Black-fronted Dotterels were still there. They just love hanging out on the road for some strange reason. The pipits are the same, they are always on the road. There was a royal spoonbill in the pond and he came quite close. Here is another shot of Platalea regia. 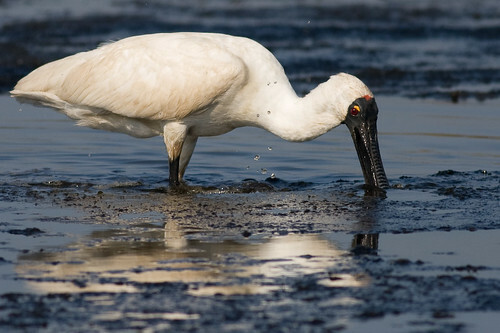 Down the road there was a baby Royal Spoonbill. As I headed home i spotted some reed-warblers in the wild fennel bushes as per usual and in the same area as the Black-shouldered Kite there was an Australian hobby sitting in a tree. See the last post for photos and story. Bird Photography at Ash Island, 23rd February, 2009. Today I got some good shots of an Australian Hobby at Ash Island. The scientific name of the Australian Hobby is Falco longipennis and it belongs to the family Falconidae, order Falconiformes. They range in size from 30 to 36 centimeters and their habitat is mainly open woodlands and forests. I had seen them twice before. 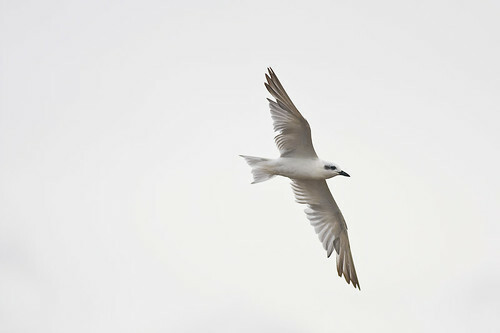 Once yesterday at Homebush Bay but it was flying really high and was like a speck in the sky. 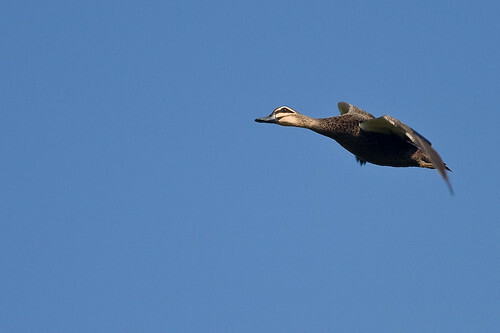 The other time was at Tomago Wetlands and then it just flew past before I had time to get a decent shot off. Today he was in a tree pretty close to the road. In this photo, you can clearly see the hooded face mask and the horizontally striped tail feathers. Also note that he only has one leg(As far as I can tell). 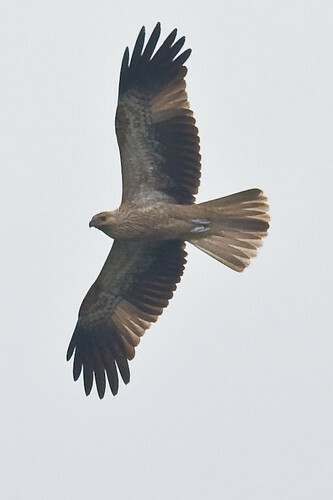 I have seen another raptor, a Whistling Kite, over at the Hunter Wetlands Center that had one leg also. I don’t know what the one-legged thing is about, but I will find out. somehow. 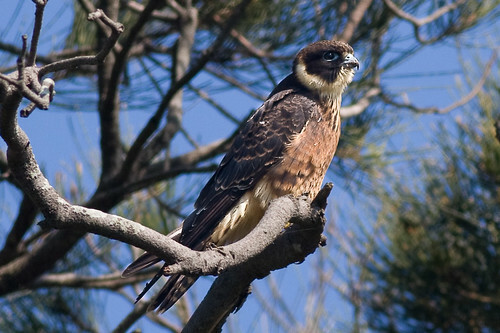 The Australian Hobby breeds in the Spring and Summer. When it is breeding it sometimes takes over the nests of other birds. The female sits on the eggs while the male does the hunting. The Australian Hobby has a tail that is more or less rounded at the tip and glides on drooped wings. 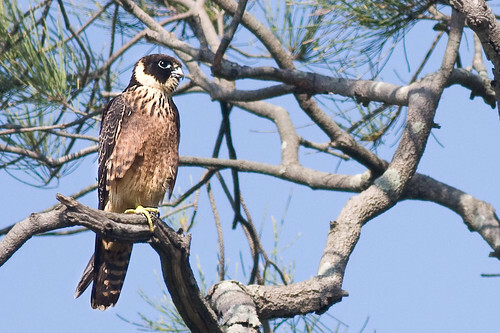 The face masking of the Australian Hobby is similar to the Peregrine Falcon. Like most falcons, the ends of the wing tips come to a downwards point. 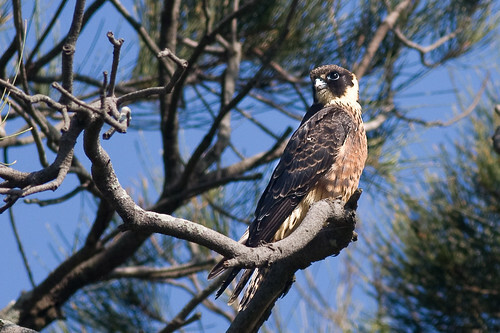 The Australian Hobby is distributed all over Australia. 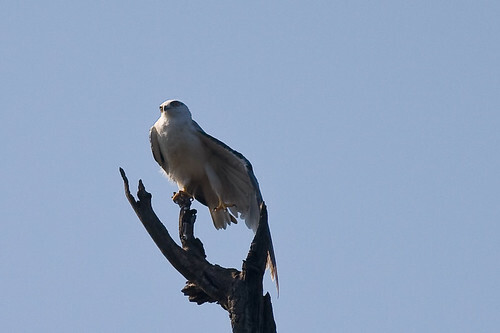 This morning at Ash Island I found a Black-shouldered Kite just sitting on a tree by the road. They are an extremely beautiful bird so I decided to dedicate a whole post to them. They deserve it. Photo number 1 is shown where you can see the identifying feature of the mark behind the eye which looks like a mask. When he was up on the tree, he adjusted his perch and had a good stretch of the leg and the wing. Maybe he was doing his aerobics or something like that. Raptor-robics. 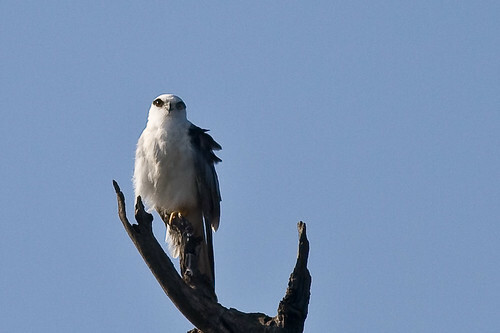 The scientific name for the Black-shouldered Kite is Elanus axillaris. Here is the bird stretching his wings whilst on the perch. Don’t they have big eyes=? All the better to see you with. After a while, he took off. Here he goes. Goodbye sweet prince. Today I went down to Sydney to Homebush Bay to have a look at the wetlands there. We had breakfast at the Cafe there when we got there, so it was really good having a coffee first up. We went down to the pond below the cafe. There were heaps of Cormorants and Darters making nests on the island. We saw a few cormorants flying past with sticks in their mouths. 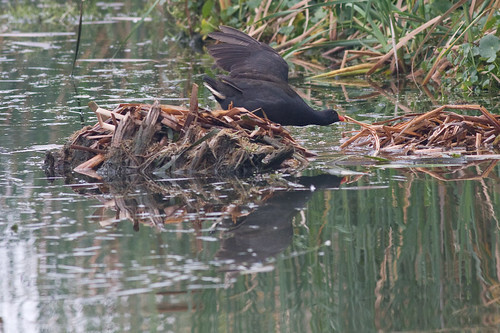 This Dusky Moorhen was making a nest right next to where heaps of people were walking past. Unbelievable. We went further around the bay to the wreck and the other wetland areas. 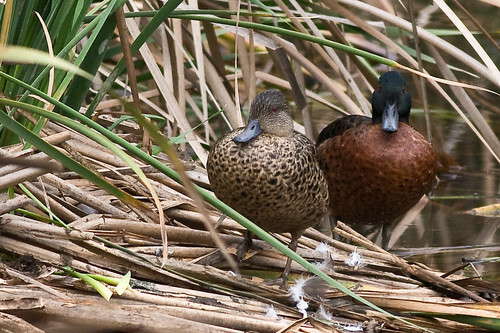 Here is a photo of a Chestnut Teal male and female which shows the differences. 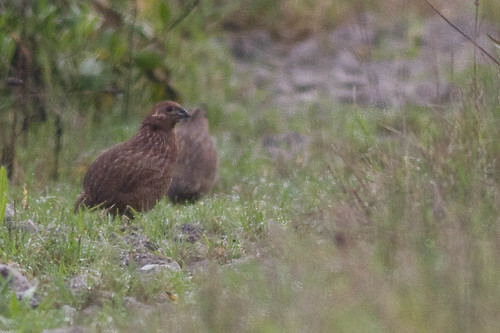 The male is on the right. 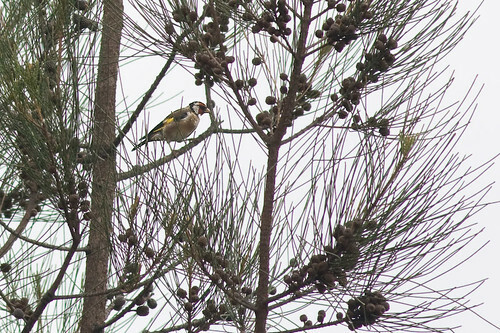 I saw some European Goldfinch which was a first for me. The photo is not the best, but at least it is a record. ha ha. 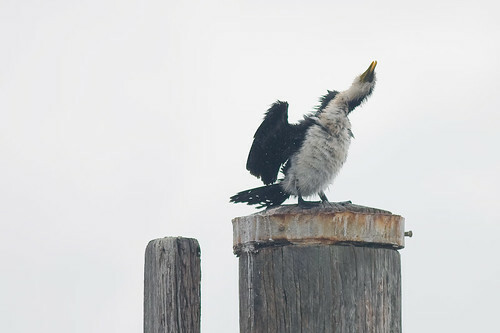 At the wreck, this Little Pied Cormorant was having a bit of a shake trying to dry off. He looks a bit like a dog having a good shake. 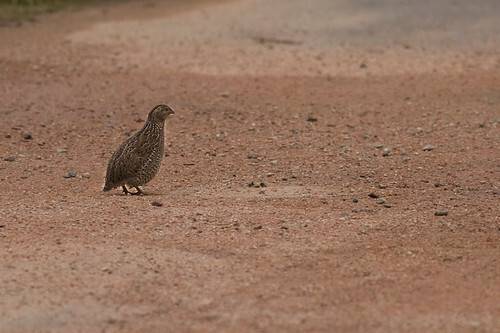 And, as a bonus, I saw some more Brown Quail today and got a relatively decent photo or two. The ones I saw the other day were too far away. Here is an adult. And last but not least is a Grey Teal. 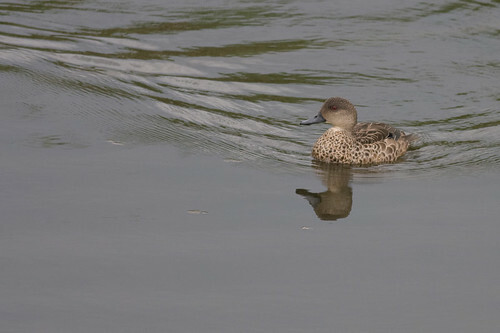 I put this photo up to show the difference between the Grey Teal and the female Chestnut Teal. Notice the white patch on the chest of the grey teal. That is how you tell the difference. 20th February, 2009. Ash Island, Newcastle. Australia. Another session this morning at Ash Island. Some days are great, other days are pretty ordinary. This day was one of the ordinary ones. It was overcast again with a temperature of between 20 to 24 degrees Celsius. I was hoping for some egrets to be getting into the frogs at the beginning of milham road, but there was nothing. 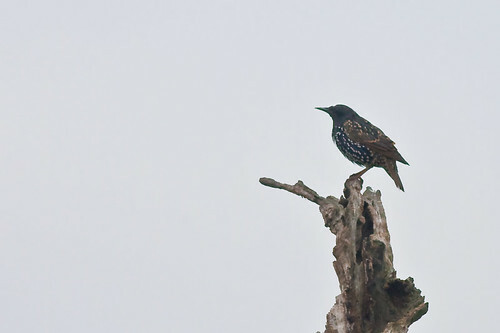 Just a common starling sitting on a dead tree. There were a few common Greenshank in the pond but a bit far away to come out as decent photos. 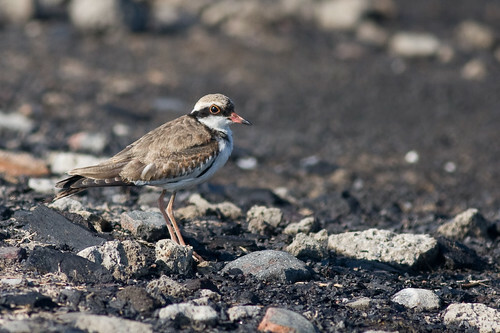 This immature Black-fronted Dotterel was hanging out around the road with a buddy. There were some Black-winged stilts , Royal Spoonbills and a little Egret. 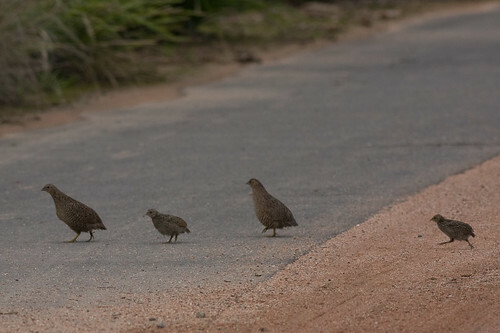 I went over the other side near the railway track and I saw some quail ahead of me on the road. So I screeched to a halt, and took some photos which werent all that crash hot, as they were too far away and heading away from me. This is the best of a bad bunch. 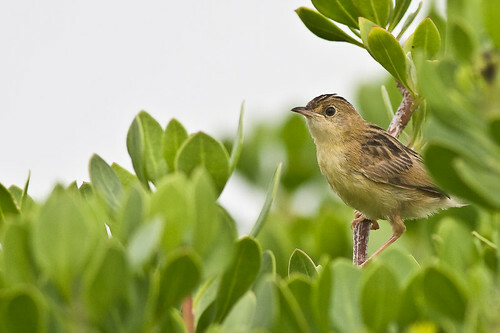 Coming back towards Wagtail Way , there were heaps of Australian Reed-warblers and Golden-headed Cisticola. This one is a breeding male, i think. And at the end of this story there is, a lizard! He was in a pond near the road. He is probably some kind of Skink. As far as I know. 18th February, 2009. Stockton Sandspit, Newcastle. I decided to go to Stockton Sandspit after my trip in the early morning to Ash Island. The tide was about half way out, which was a good thing. I am not sure if it was coming in or going out. I have lost track of the tides since all the rainy weather. Speaking of which, today was overcast and the light was rubbish. To start my story, as soon as I got there i spied a young White-bellied Sea-eagle being hassled by a pair of Masked Lapwings. Those Masked Lapwings are aggressive birds, they are forever having a go at raptors. On the mudflats was a mix of Bar-tailed Godwits, Curlew Sandpipers, Black-tailed Godwits, Red-capped Plovers, as well as the usual flock of Red-necked Avocets. 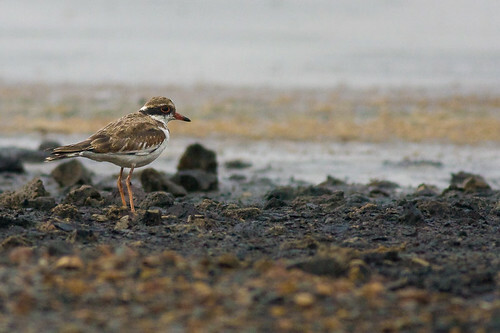 It is extremely difficult to identify most of the waders, as they look so similar. I have a hard time differentiating the Bar-tailed Godwit from the Black-tailed Godwit when they are on land. When they are in flight, the Black-tailed Godwit is easy to identify with the white on the tail, and the white stripes on the wings. 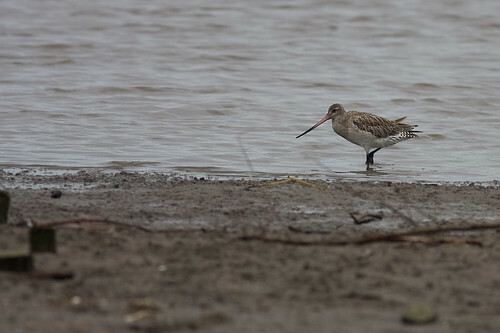 Here is what i think is a Bar-tailed Godwit. I could be very wrong, of course. Notice the the bill is slightly upturned whereas the Black-tailed Godwit has a straighter bill. 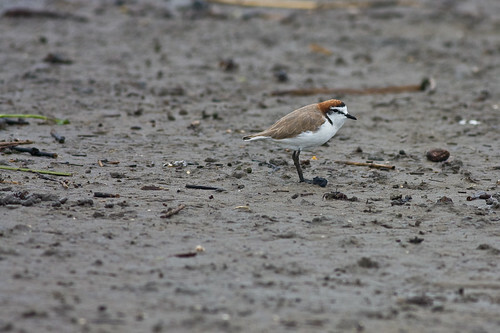 Here is a cute little Red-capped Plover. They always manage to delight and have a very high awww factor. 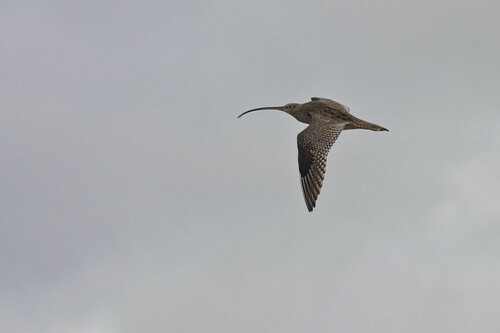 There was a couple of Pied Oystercatcher down the beach and I managed to get this photograph of an Eastern Curlew in flight. There were a couple of species of Terns on the mudflat, the Crested Terns were just playing it cool, while this young Gull-billed Tern was flying around catching a few of them little crabs with eyes on stalks. Semaphore crabs, I think they are called. Well the Gull-billed Tern managed to catch a couple of them. I dont think it would be that hard because there were thousands of them. There is no lack of food at that sandspit. Well, that’s enough for one day. I was out all morning and I am knackered!